In thinking of the young child’s free creative play materials, a fitting motto we can keep in mind is, “Anything can be anything.” But what does that mean? 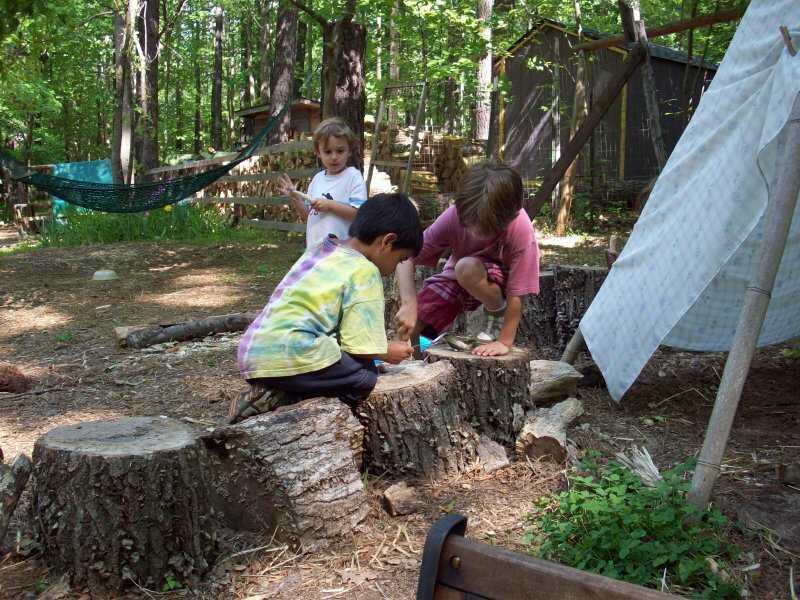 Children need play materials that are open-ended enough to meet new needs each day, to fill the demands of their imagination. A toy needs to be “unformed” enough to be reasonably used as many things, in many circumstances. For instance, a red fire truck, with a remote control, will always be destined to be just that. But a simple, open-bed wooden truck can be a fire truck, a farm vehicle, a bus, a lumber wagon, or even a truck that floats on water! Or, better yet, an open basket can be a bed, a suitcase, a grocery bag, a hat, or, when turned upside down, a mountain, a prison, a cave, a hiding place ?.?.?. anything can be anything! Yesterday on The Rose Garden playground we were surprised and delighted by this principle in-action. Sitting on the tree stumps was a small group of musicians, busy singing, tapping their feet and strumming banjos, mandolins and guitars. In the corner, the old wooden ladder had been laid down to become a rocket ship. Comfortable reclining chairs for the space-explorers were under construction. Beside the porch, a group of mothers attended their babies, giving them baths in the large bucket. Occasionally we were asked to baby-sit the fresh-scrubbed babies so grocery shopping could be done. What is the magic, what is the common thread here? Banjos, mandolins, guitars, as well as comfy chairs for the rocket ship and even the darling babies themselves, all of these remarkably different playthings were….the playground boards! The absolute wonder, the vast breadth of the young child’s imagination lies waiting for us to allow enough time and enough open-ended “toys” for it to blossom. Toys: sticks, pine cones, boards, bricks, lawn-mower tires, rope, pieces of slate, bales of hay, un-baled hay, piles of leaves….you get the idea! Today the children came indoors to have their snack of buckwheat (ask me for the recipe) and then proceeded to play utterly independently and engaged, needing no help, inspiration or guidance from Rebecca and me. We sat in amazed awe at these very young children whose imaginations soared, whose social skills greased the engines of Play, and whose movement was orchestrated like a bee-hive! The sound of children engaged in “deep Play” is a particular music, perhaps like the reverberations of the Universe at work…Pure Grace! Let’s take a moment to think about our children’s hands…. In his book The Hand: How It Shapes the Brain, Language, and Culture, neurologist Frank Wilson shows us the pivotal place of the human hand, equipped with our amazing thumb, in the evolution of the species. He argues passionately for the education of the hand, assuring us that people who use their hands, woodworkers, artists and plumbers alike, have a way of knowing the world that is inaccessible to those who have less hand training. We know that the density of nerve endings in our fingertips is enormous, and when these are engaged in childhood, the brain is enriched beyond measure. Through artistic expression, through free creative play, through engagement with the natural world the hand, and therefore the mind, is introduced to its own astonishing creative potential. Are you wondering how to slow down the pace of your family’s life, how to create harmony and rhythm in your home, and how to take care of yourself as well? 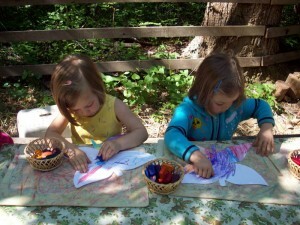 My friend Donna Ashton, at The Waldorf Connection, is offering a six-week course in Essentials of Early Childhood which promises to offer insight and inspiration. Topics will include Child Development, Rhythm, Creative Play, Discipline and more. I will again be one of the presenters, and I very much look forward to participating. Below is a description, and a link to log-on. The introductory class is tomorrow, Sept 23, and I will be offering thoughts on Rhythm, while others will present the topics mentioned. This is a great chance to take a class while at ease and at home! La Leche League Conference is coming soon! We know how deeply nutrition affects healthy brain development, and yet have we ever considered that each aspect of the young child’s life is also ‘nutritional?’ Because the young child is at-one with their environment, they absorb the totality of their environment at the most profound level, in a way similar to the digestive system which absorbs everything that is taken in. We will take an in-depth look at the development of the brain, beginning in pregnancy, and extending through childhood. Come learn the fundamentals of healthy brain development, and how to create home environments that promote the fullest whole-brain development. Keynote is FREE with a conference registration! This presentation is going to be amazing! 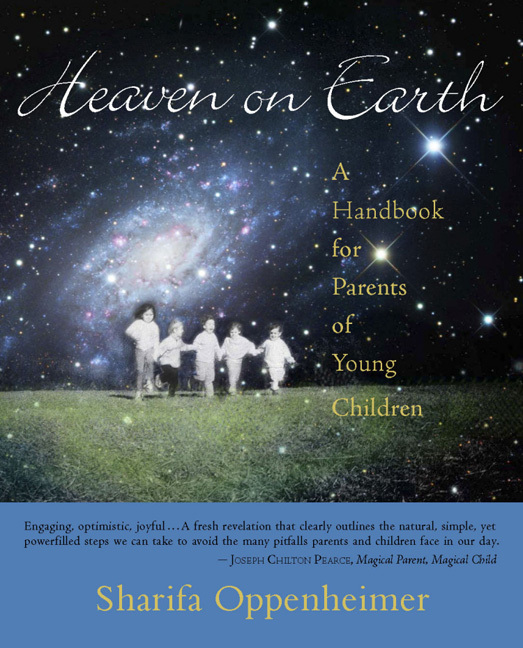 Sharifa will be available to sign your copy of HEAVEN ON EARTH – Saturday – 12:15-1:00pm. Hello Friends of Heaven on Earth! It is a pleasure to let you know I will be speaking this coming Tuesday night (June 16) at The Waldorf Connection Home School Expo. This is an on-line tele-seminar, offered to to you completely free. Tuesday evening’s talk will be about Establishing Healthy Home Rhythms. Other topics you might be interested in are “Rites of Passage” “Handwork” “Music”, and more. Each Tuesday and Thursday evening for the next four weeks, a topic will be presented by experts in the area. Be sure to check the Super Saturday schedule of speakers, as well. When you register, you are given the contact info to dial-in or log-on, and join the conversation! This new program is positioned to give you the information on planning your upcoming year, help with rhythm in your home and give you a chance to experience LIVE speakers & teachers in the Waldorf Community. The series begins Thursday May 27 and is totally Free! All you need to do is register and I will send you all the dial-in information and webcast links. 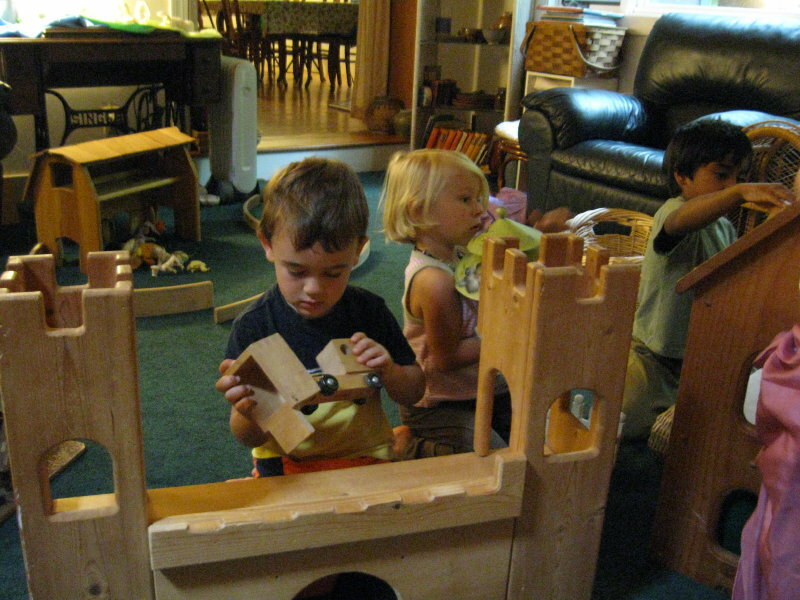 It is tempting to create our child’s playspace upstairs, or in the room around the corner. What we may find with a child younger than five, though, is that he gathers his toys and brings them wherever we are. Wherever the most traffic is, wherever life is lived the most, that is exactly where he wants to be. If the kitchen is the central place, with the dining room off the kitchen, this is the perfect place for him. If the living room adjoins the dining room, better still. On a rainy day children have the long expanse of time to deepen into their play. Story lines can become complex and filled with the stuff of human dilemma. Or fanciful flights of imagination can arise. 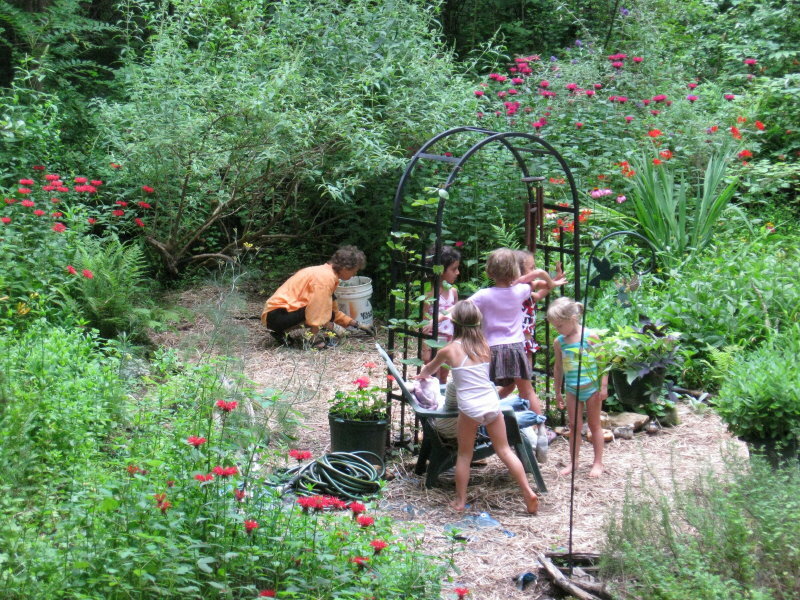 Let’s allow these rains to not only nurture our gardens, but our children’s creative imagination, as well. Relax and enjoy! Young children are close to the realm of nature because they are still very natural beings. Because their consciousness is not yet separated from the environment, because they still live in the consciousness of oneness, of unity, they belong still to the natural world. In time they will belong to themselves, as the process of individuation becomes complete. But for about the first seven years, they are still at one with the world they inhabit. The process of separating from the parents and from the environment buds only around age seven. Before that, the child is moved along by life, something like the way a tree’s leaves dance in the breeze. The young child responds to the environment in a very unself-conscious way, a very natural way, and the open, complex, and diverse environment of the outdoors gives him that opportunity. To watch these young children play freely in the natural world is like watching the time-elapsed photographs of a flower opening. 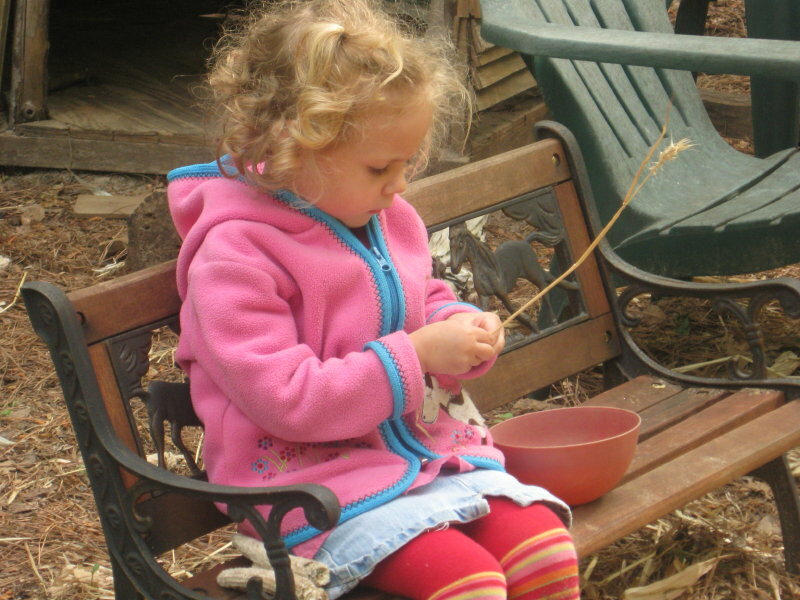 Today eleven children spent more than an hour taking the kernels off Indian corn, and developing story lines which sprang from this: be-jeweled fairy houses, grinding stations, corn deliveries…the engines of society were revving, the intelligence pool of the future was popping.